In Houston, America's Diverse Future Has Already Arrived : It's All Politics To see the speed of demographic change in Texas, look no further than Houston. Over the last few decades — despite crippling humidity, long commutes and a reputation for refineries — the city has become the most diverse in the nation. 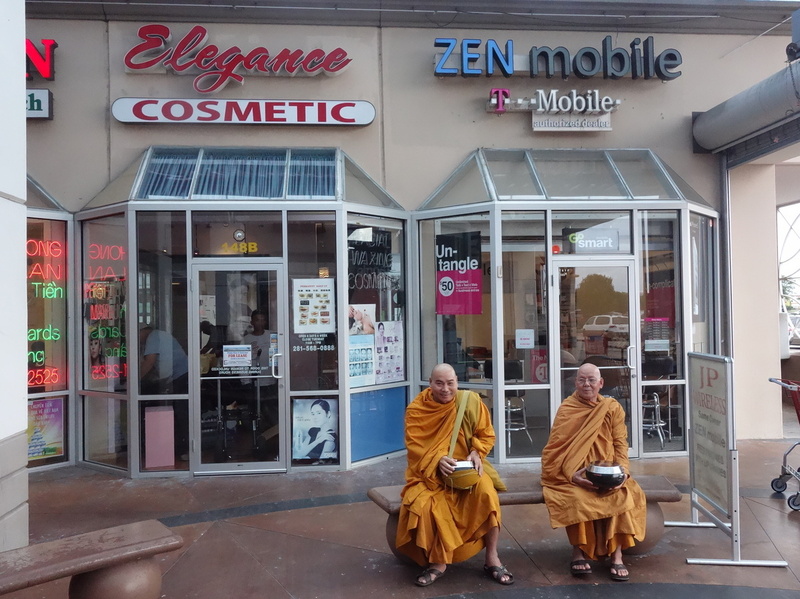 Buddhist monks sit outside a Zen Mobile store in southwest Houston. To see the speed of demographic change in Texas, look no further than its largest city — Houston. Only 40 percent of the city's population is non-Hispanic white, and by a Rice University count, it's the most racially and ethnically diverse city in America. "Houston is an immigrant magnet," says Glenda Joe, a Chinese-Texan community organizer whose extended family came to Houston in the 1880s. 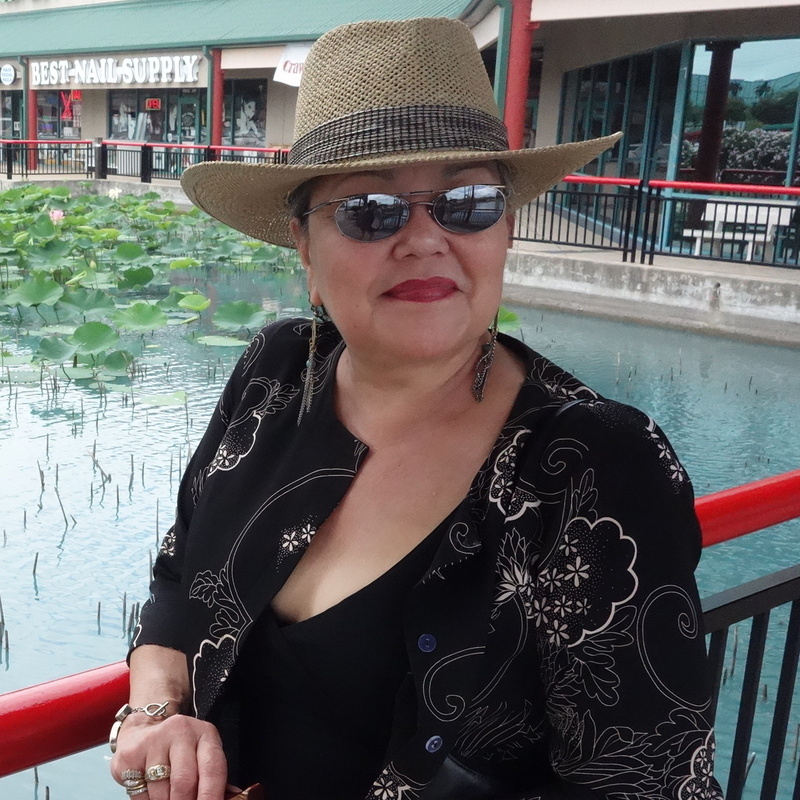 Glenda Joe, a seventh-generation Chinese-Houstonian. "Texas looks like me. I'm half-Chinese; I'm half-Irish," she says. "I also do business; I work with universities; I also ride horses. That's what Texas is." At about 35 percent of the population, Latinos make up the second-biggest group in Houston after non-Hispanic whites or Anglos, according to Census numbers. But Asian-Americans are the fastest-growing group — doubling between the 1990 and 2010 census to about 7 percent. "There is no majority group here, not even close," says Michael Emerson, a Rice University sociologist who studies Houston's demographic change. He and his research partners put together the 2012 analysis that gave Houston the title of most diverse metropolitan area in America. 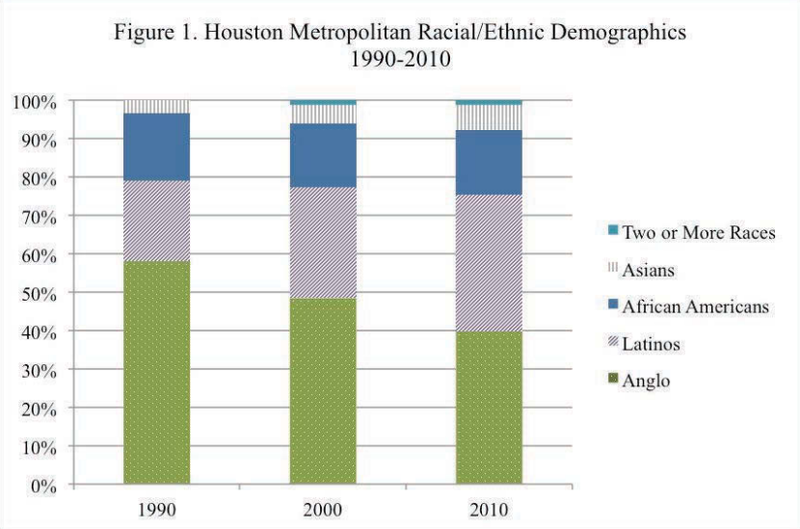 If you look at the four major ethnic groups — Anglo, black, Asian and Latino — all have substantial numbers in Houston, with no one group dominating. It comes closer to having an equal balance of each group than you would find in New York or Los Angeles. The city's transformation to an international megalopolis happened quickly, and only within the past few decades. As the metro area shot to nearly 6 million people, 93 percent of all that growth was non-white. "Houston runs about 10, 15 years ahead of Texas, 30 years ahead of the U.S., in terms of ethnic diversity and immigration flows," Emerson says. "So it is fundamentally transformed in a way that all of America shall transform." Jobs fuel the transformation. The energy industry remains a huge player, but there's also the Texas Medical Center, burgeoning biotech and a bustling shipping port. Despite crippling humidity, long commutes and a reputation for refineries, Houston's cheap land, affordable homes and low barriers to doing business have lured immigrants from all over. "You are here to make your fortune; you are here to move ahead in the world. You are about making things happen. There's no way that you could be a leader here in this community and not recognize that," says Houston Mayor Annise Parker, who is a minority among politicians. She's the only female mayor among the top 10 most populous cities, and she's one of the only openly gay politicians, period. And she's learned a few lessons about governing a place where different cultures combine. "Too often what happens in a state capital or in Washington is that it is about parties and partisanship, not about the practical realities of running something. Cities have to run," Parker says. For her, running the place means embracing the sociological situation. Houston is remarkably practical that way. Just ask seventh-generation Chinese-Houstonian Glenda Joe. "It's inexorable. The change in terms of leadership, the change in terms of how we look — it's inexorable," Joe says.